Electronic health records (EHRs) are supposed to make things easier for doctors, improve health outcomes for patients, and create a better experience for everyone. However, most research indicates the opposite. There is a high level of EHR dissatisfaction among practitioners and the impact on patient experience has been underwhelming. So, what has gone wrong? When EHR system use became mandated, clinicians were expected to experience initial growing pains as they were forced to learn new skills. However, as comfort levels grew, their perceptions were expected to change over time, resulting in better communication and care. Unfortunately, doctors are still complaining about EHRs even after several years of widespread implementation and use. In fact, research shows that EHRs have become a major contributing factor to physician burnout. Too much manual data entry causes physician dissatisfaction with EHRs. The aforementioned Mayo Clinic Proceedings study also found that as many as 84.5% of physicians are using EHRs and the majority of them are not satisfied. Most physicians feel that EHRs are inefficent and require too much manual data entry where time is spent on clerical tasks rather than patient interactions. Likewise, patients are also not satisfied with EHRs as they notice doctors spending more time looking at the computer screen during their visits. Research shows that gaze time (amount of time the doctor looks at the patient) is directly related to patient satisfaction. Apart from data entry issues, a RAND study identified many other reasons for EHR dissatisfaction among physicians. For example, most physicians agreed that EHR interfaces were not intuitive, thus hampering their workflow instead of augmenting it. They also complain that EHRs are not implemented well enough to facilitate the proper exchange of information. Many physicians feel overloaded with irrelevant information. Doctors also noticed that templates provided with EHR systems degraded the quality of their reports. Even more worrisome is that most physicians found that EHRs are not improving over time. Undoubtedly, these studies indicate the need for a system update and technology that frees doctors from having to spend time on routine clerical or data entry tasks. This technology would ideally enable clinicians to focus on their primary responsibility – carefully listening to, observing, and getting to know their patients so they can provide the highest level of care. This is where RightPatient can help by providing an AI system that automatically identifies patients when they arrive and then engages with them to collect useful information that is pushed into the EHR system. This enables clinicians to understand much more about a patient’s condition while reducing their data entry burden. With RightPatient, doctors receive concise, relevant, and real-time information regarding their patients to save time, increase efficiency, and improve the patient experience. http://www.rightpatient.com/wp-content/uploads/2018/09/dreamstime_xxl_86516400.jpg 1268 2048 Michael Trader http://www.rightpatient.com/wp-content/uploads/2019/02/RightPatient-Biometric-Patient-Identification-Data-Integrity-Platform-kernello-health.png Michael Trader2018-09-05 19:01:532019-02-18 07:48:07EHRs: Why are physicians and patients dissatisfied with them? The U.S. healthcare system has long suffered from the problem of excessive patient waiting times. In 2015, 32% of visits to the ED resulted in patient wait times of up to an hour. Obtaining an initial outpatient appointment with a physician can take a month or more. The fact is that waiting times can be unbearably long for patients and doctors are often helpless in solving the issue. Long waiting times can have a negative impact on a patient’s health by causing delays in consultations. Furthermore, wait times reduce patient satisfaction scores with healthcare service providers. Research has shown that patient satisfaction scores were affected across almost every aspect of care delivery when waiting times were long, with patients reporting lower levels of confidence in the care provider. Longer waiting times not only impact overall patient satisfaction, they also negatively affect the way that patients perceive the information, instruction, and care provided by their caregivers and physicians. Clinics have adopted various methods to improve satisfaction while a patient is waiting for an appointment. These typically involve providing information regarding different disease conditions, tips on practicing a healthy lifestyle, etc. ; essentially, they their best to make waiting areas comfortable and informative. Additionally, some clinics use office staff to gather information from the patient. However, in many cases, the information provided by the clinic may not be relevant to the patient. Similarly, gathering information about the patient through staff is an expensive activity with limited benefits. As we have seen, patient wait times can have a negative impact on both patients and their clinicians. However, what if there was a way to utilize these waiting times more productively? Can patients be engaged in a more meaningful way while they are waiting? This is precisely where RightPatient can help. RightPatient can help to improve the patient experience and optimize wait times through its autonomous check-in process. When patients arrive for scheduled outpatient visits, RightPatient automatically recognizes them and engages through an AI-driven chat session. This enables patients to learn about their conditions as important clinical information is collected, which is automatically fed into the EHR. The clinical team can review this information prior to the consultation, saving time and increasing efficiency by eliminating the need for manual data entry into the EHR system. Physicians can then spend this time interacting directly with the patient to bolster satisfaction and clinical outcomes. RightPatient enables doctors to spend more time focused on what they want to be doing – listening to patients, addressing their emotional and physical well-being, and spending less time worrying about data entry into health records. Satisfied and engaged patients also respond more favorably to more personal interactions with their caregivers, creating a win-win environment. The US is enduring a massive opioid abuse epidemic. Not only are they widely prescribed, but prescription opioids are now more widely abused than street drugs. If we look at the anatomy of the opioid crisis, it is genuinely frightening. In 2016, 116 people died each day due to opioid overdose, resulting in more than 42,000 fatalities in a single year. The question is, why is this happening? How are 11.5 million individuals misusing prescription opioids? How is it that each year, 2.1 million people misuse opioids for the first time? It seems that, at present, there is no clear path to stunting this epidemic. Opioid abuse is already costing the US economy more than half a billion dollars annually. Since the 1990s, the pharmaceutical industry started pushing opioids and assured doctors that these drugs were safe. Consequently, doctors began widespread prescription of these drugs. However, blaming the pharmaceuticals industry and doctors alone ignores many other pertinent factors. There have been many changes regarding the prevalence of various diseases over the last three decades. Slowly and steadily, medicine has become dominated by chronic and painful health conditions. It is estimated that one-third or the U.S. population or 100 million Americans are living with a chronic and acute pain condition. Among them, one-fifth are living with moderate to severe pain. Considering these statistics, it follows that opioids would be widely prescribed. However, 8-12 percent of those prescribed opioids result in patients developing an addiction. Opioid misuse is not just limited to those living with painful conditions. Many of the prescribed opioids end up in the wrong hands. Many addicted to opiates hide their identity or medical conditions and visit various clinics under different aliases. For doctors, it is challenging to identify the right patient. How can we reverse the epidemic? To bend the trend downwards, efforts must be implemented at every level. At the community level, we must educate the public and raise awareness about the health risks of opioid abuse. Policymakers should advance legislation to address the problem. Above all, there is a need to change the way medicine is practiced; healthcare providers must take higher precautions at the clinical level. Clinicians cannot and should not deprive people in pain from drugs that can bring them needed comfort. However, big data and technology can assist them in differentiating between the right patient and the wrong one. This is where RightPatient can play a vital role. Powered by artificial intelligence, the platform can help clinicians to thwart medical identity fraud and ensure that a patient’s complete and accurate medical history can be retrieved. 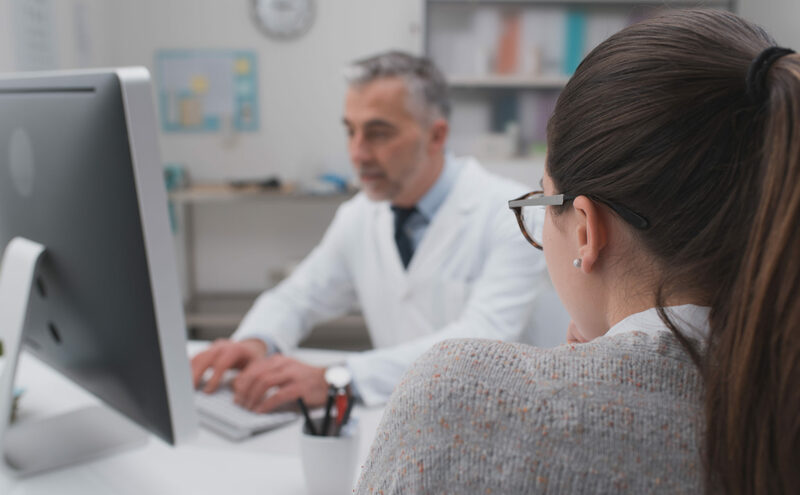 By recognizing the correct patient, clinicians can better understand the validity of patient complaints along with a patient’s disease history. When and where was the patient last prescribed an opioid? Did the patient rightly identify himself/herself? RightPatient can be one way to prevent opioid abuse.